Even as India bats for biodiversity investments at a UN convention of experts from 193 countries, the planet is staring at an imminent crisis that could wipe out life as we know it. This would be a good poster for geography, biology, general science and world history courses. Can your drafting class print this out for you in poster format? When all of the “coal mine canaries” on Earth die out, how much longer have humans left to live on Earth? What hope have we, with yahoos like this leading us in Congress? Can the Houston toad survive Texas wildfires and droughts? Birds do it, bees do it, even educated fleas do it. Plants do it, too, but often with the help of animals. What will we do if the bees vanish? http://www.ted.com Pollination: it’s vital to life on Earth, but largely unseen by the human eye. Filmmaker Louie Schwartzberg [of Moving Art] shows us the intricate world of pollen and pollinators with gorgeous high-speed images from his film “Wings of Life,” inspired by the vanishing of one of nature’s primary pollinators, the honeybee. All mammals have the nerve, and as a result of our fishy ancestry, in all mammals, the nerve goes down the neck, through a heart blood vessel loop, and back up. In fish, of course, the distance is shorter — fish have no necks. Tip of the old scrub brush to Pharyngula’s Sciblogs site. Yes, the laryngeal nerve is sometimes called the vagus nerve, because it originates off of the vagus nerve. Giraffe’s laryngeal nerve, easily explained by evolution; paints picture of an evil, joker designer otherwise. Friday Fox will not be a regular feature — but, Wow! isn’t that a great photo? Defenders of Wildlife called for entries for the 2010 wildlife and wilderness photography contest. They got more than 10,000 entries, and they’ve got the top 10. They want you to vote for the best one. The photo above is just one of the spectacular nominees. I predict one of the photos featuring animals will win, but the wild lands photos are great, too. You may vote for three. Voting ends Sunday, April 4, 2010. As I sit with officials from the Texas Education Agency and the Dallas ISD discussing what goes on in our classrooms, I often reflect that the drive to testing frequently pushes education out of the classroom. One of my favorite education blogs, the Living Classroom, comes out of a the West Seattle Community School where, many days — perhaps most days — education goes on in wonderful ways. No test could ever capture the progress made. Latest example: This boy made this squid. He had fun doing it. He learned a lot. Look at the excitement. It’s pretty colorful, even for a squid, but I’ll wager the kid now knows more about squids than most Texas ninth grade biology students. Of course, sewing squids is not among the list of Texas Essential Knowledge and Skills. What Asher now knows . . . such learning would have to be smuggled into a Texas classroom. When education is outlawed, only outlaws will have education. Kate closed down Radula, and moved all her blogging to Adventures of a Free Range Urban Primate. Did you ever wonder what it’s like to work in the kitchen of a zoo? Kate has the lowdown. 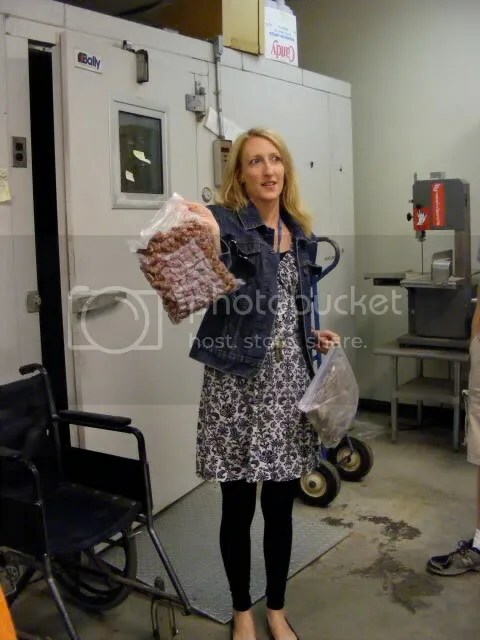 From Urban Primate: "Just to see the scope of what's stored there, in one hand Allyson is holding meatballs. In the other, whole frozen birds . . . complete with feathers." The photos from that post alone would make a good PowerPoint for some biology class, or a discussion of animals in an elementary class. You are currently browsing the archives for the Zoology category.